The 2012 Olympic are just about to get underway in London and as is tradition, the hosting nation will kick off the Olympic Games with the Opening Ceremony on Friday, July 27 at 4pm ET. For those of you who don’t have a TV to watch it on, you can watch the Opening Ceremony for the 2012 Olympic Games live online for free with the help of FreeCast’s Live Olympic Coverage Guide. The Opening Ceremony for the 2012 Olympics in London, titled ‘Isles of Wonder’, will begin with the sound of Europe’s largest harmonically-tuned bell. The opening scene, ‘Green and Pleasant’, will involve farmyard animals, as London has remodeled the Olympic Stadium to resemble a British countryside setting. Be sure to watch the Opening Ceremony of the 2012 Olympics live online for free to see how London’s presentation compares to the incredible show put on by the Chinese in Beijing. There will be 15,000 performers between the Opening and Closing Ceremonies of the 2012 London Olympics and you can find out which famous musicians will be making appearances by watching free live streaming coverage of the Ceremonies online with FreeCast. After the Head of State of the Host Country, Queen Elizabeth II, is greeted at the entrance of the Olympic Stadium by President of the IOC Jacques Rogge, the participating teams in the 2012 Olympic Games will be presented one nation at a time, in alphabetical order (with the exception of Greece, who comes out first and Great Britain who comes out last). LOCOG Chair Seb Coe and Jacques Rogge will each then give a speech, which you can watch live online for free, and then conclude their speeches by encouraging Queen Elizabeth II to officially announce the opening of the 2012 Olympic Games in London. Then, it will be time to present the Olympic Flag to the world as the Great Britain plays its Anthem and a participating athlete, coach and judge from the Host Nation of the Olympics each take the Oath in which they vow to compete and judge in accordance with the particular rules of their respective sports. 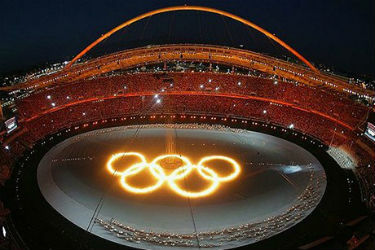 Watch the Opening Ceremony live online for free so you can take in all of the excitement surround the London Olympics. Finally, to wrap up the Opening Ceremony, the Olympic Flame will enter the Stadium before being passing through the hands of the Olympic athletes, all the way to the final Torchbearer. The Torchbearer will then light the cauldron to signal that the 2012 Olympic have officially begun and the Flame will burn for throughout the Games in London. You won’t want to miss out on watching the Opening Ceremony of the 2012 Olympic Games in London as live coverage of the event will stream online for free. Be sure to visit FreeCast to watch the Olympic Games Opening Ceremony live online for free, as well as your favorite Olympic sports as soon as they begin. If you can’t make it to a television or a computer, you can also watch the Opening Ceremony of the 2012 Olympic Games live online for free through your mobile device.